The TETRAD Constable sofa and wing armchair shown on this page are available to view in our showrooms. 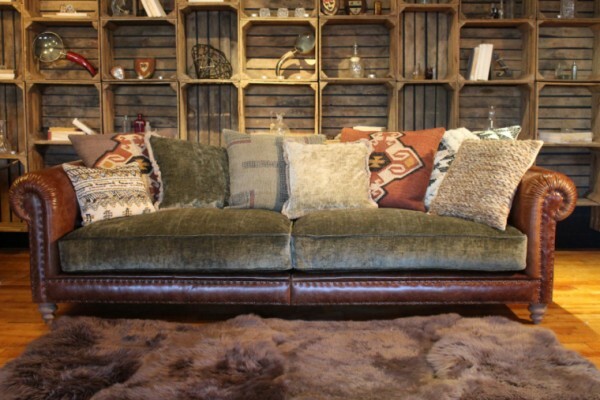 At Harvest Moon we stock a huge range of Tetrad mixed and fabric sofas including the award winning Constable sofa range so take a look around. You can also visit us in sunny Southport at our Tetrad showroom. Visit Harvest Moon. FREE delivery on all TETRAD furniture orders to UK mainland addresses at Harvest Moon! We can also deliver new Tetrad sofas and chairs anywhere in Europe by dedicated carrier please ask for a quote. NEW - The Tetrad Constable is a brand new range comprising of a mixed leather and fabric (velvet) 4 seater grand sofa, 3 seater midi sofa, a snuggler chair / sofa (1.5 seater), wing armchair, large rectangular stool and small square stool. The Constable range is handcrafted by Tetrad right here in the UK using the finest Italian leathers and Peruvian scatters. The sofas, 1.5 seater snuggler and wing armchair have a Serpentine sprung seat with feather filled comfort wrap seat cushions. The sofas, chairs and stools have hand studding details to the arm and facings. For ease of delivery the Constable grand sofa can be split for ease of delivery. Legs are also removable. All scatter cushions shown in the images are included, so the Constable grand sofa comes with 8 scatters, the midi sofa with 7 scatters, the snuggler with 4 scatters and the wing armchair with 1 scatter. 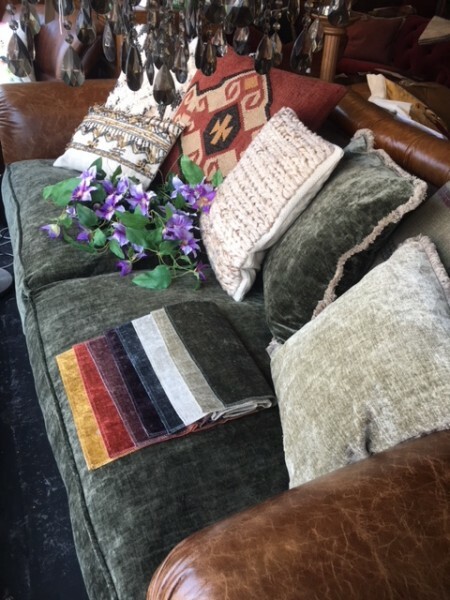 The scatters are a beautiful mixture of woven wool / jute, woven wool / cotton, cotton embroidered, cotton printed and velvets. All pieces in the Constable upholstery range are available with a choice of 3 different finishes for the legs, Dark Mahogany, Driftwood or Natural. 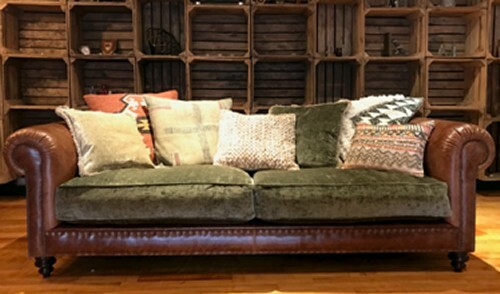 The Tetrad Constable grand sofa is available as standard in the upholstery option as shown further above, in Galveston Bark leather with Amalfi Chocolate velvet on the back, behind the scatter cushions, and seat cushions in Coco Olive velvet and Driftwood legs. 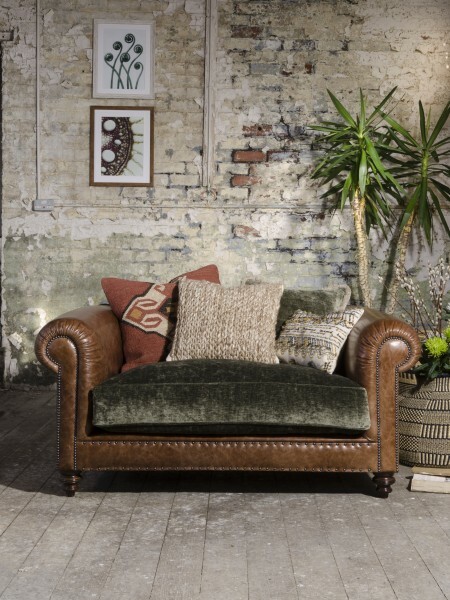 You can also choose to have the Constable sofas, chair or stool seat in any of the Coco Velvet fabric options which can be seen in the image below. You can also choose the colour of the legs for your Constable sofa, choose between Dark Mahogany, Driftwood or Natural. 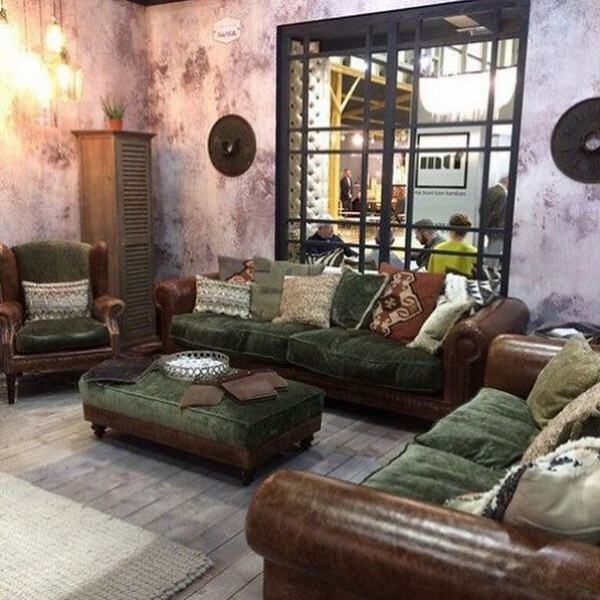 The image above shows the Tetrad Constable midi sofa on display in our Southport furniture showrooms along with the Coco Velvet fabric swatches, the colours from left to right are: Bronze, Spice, Mauve, Violet, Slate, Pearl, Sand and Olive. Fabric and leather swatches for the Constable range are available direct from Tetrad on 01772 792936. The image above shows the Tetrad Constable grand and midi sofas, wing armchair and rectangular stool all with Dark Mahogany legs. 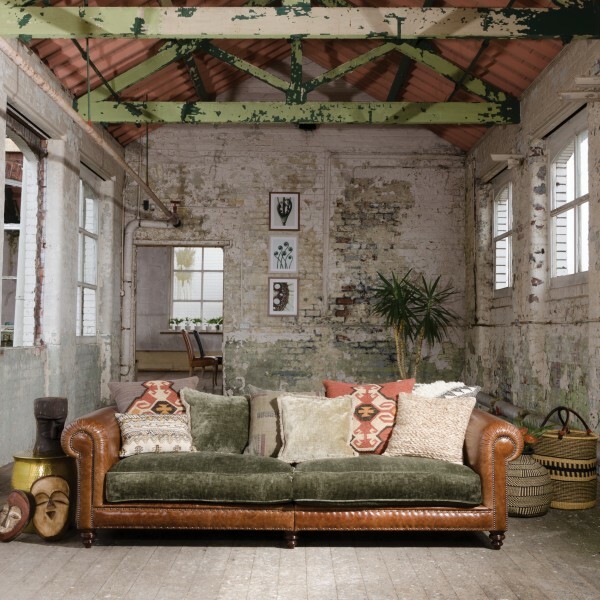 The Constable sofas are available as standard as shown in Galveston Bark leather with Amalfi Chocolate velvet on the back, behind the scatter cushions, and seat cushions in Coco Olive velvet. 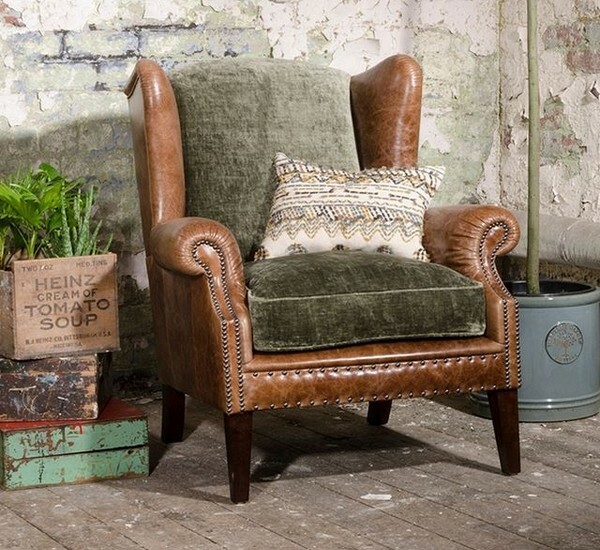 The Constable wing armchair is available as standard, as shown, in Galveston Bark leather with back and seat cushion in Coco Olive velvet and the rectangular stool is available as standard in Galveston Bark leather with a Coco Olive velvet cushion top. As mentioned and shown further above you can also choose to have the Constable sofas, chair or stool seat in any of the Coco Velvet fabrics. The image above also shows the Tetrad Constable 3 seater midi sofa with the same Dark Mahogany legs option and 7 luxurious scatter cushions and below you can see the Constable 4 seater grand sofa in another setting also with the Dark Mahogany legs and 8 scatter cushions. The image below shows the Tetrad Constable wing armchair in Galveston Bark leather with back and seat cushion in Coco Olive velvet and with the Dark Mahogany legs option. 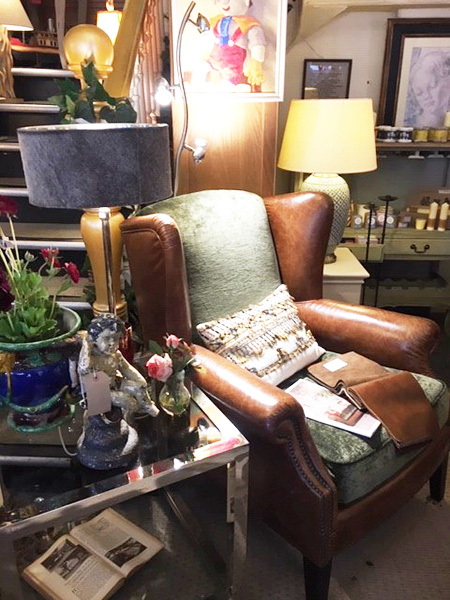 The image below shows the Tetrad Constable wing armchair on display in our Southport furniture showrooms along with several pieces of Country House furniture and lighting. 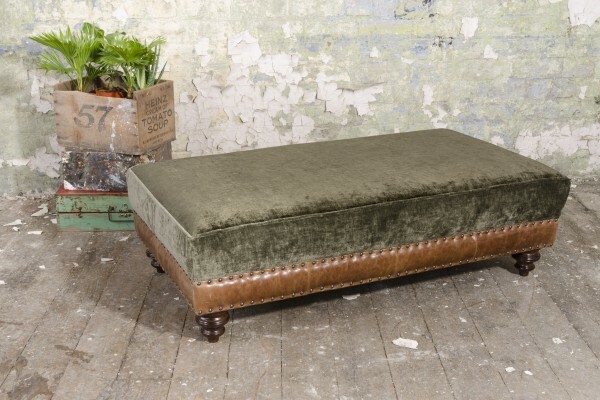 The image below shows the Tetrad Constable large rectangular footstool in Galveston Bark leather with a Coco Olive velvet cushion top and Dark Mahogany legs. The image below shows the 1.5 seater Tetrad Constable snuggler sofa which is available in the same leather / upholstery as the sofas. The Tetrad Constable range also includes a small square stool which is available in the same leather / upholstery as the rectangular stool. Fabric and leather swatches are available direct from Tetrad on 01772 792936.